Grab this free eBook from Amazon…“My Favorite Gluten Free Cake Recipes” : 25 Quick and Easy Mouth Watering Gluten Free Cake Recipes (Quick & Easy Gluten Free Recipes)…will likely only be free today! 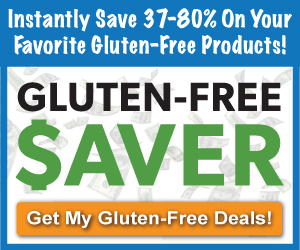 Thanks Gluten Freely Frugal! Grab this free eBook from Amazon…Gluten-Free Express Recipe Cookbook: 50 Fast And Easy Tasty Gluten-Free Recipes…will likely only be free today! Thanks Gluten Freely Frugal! Free Today on Amazon…The Slow Cooker Celiac E-Cookbook., Kindle version of the cookbook. You can get Kindle for your PC or Mac, also on your iPhone, iPad. You don’t have to have a Kindle reader to get this free e-cookbook. Thanks Gluten Freely Frugal! Grab this free eBook from Amazon…Gluten Free Cupcake Recipes: 24 Easy And Delicious Treats For The Whole Family…will likely only be free today! Food on the Table Meal Planning Service – FREE FOR LIFE! Get Food on the Table, free for life! Yep, that’s right…I’m super excited about this! They have all sorts of food allergy friendly recipes that you can choose from. Just use the coupon code FEBFREE to take advantage of this deal! Happy Meal Planning!